Jacey’s spring pics came in today and now I need to get them all packaged up and in the mail. 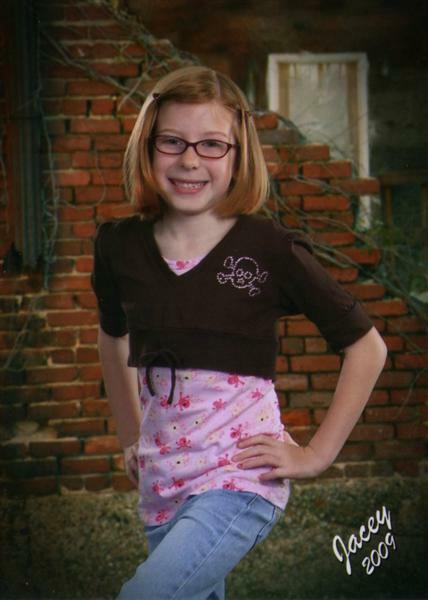 I rarely ever like her school pics, but I was actually okay with these. I thought they were only taking class pics this spring, but apparently not. The picture won’t be totally representative of Jacey in a few days though. After all this time of her wanting her hair long (and me hating it), she has decided that the tangles are not worth it (YES!). In fact, she says tangles are worthless! I’m not sure if you noticed or not, but I added a verse to my sidebar. A friend recently posted this on her facebook page and it was exactly what I needed to read at that exact moment. It is something I have really been struggling with lately. Jacey had her dentist appt/teeth cleaning today and it is official…the child has no chance of not needing braces. Should I start a savings account specifically for that now :)? Her teeth are perfect, no cavities, she is just like me and has too many teeth for her small mouth. She’s thrilled though about needing braces, although I foresee that opinion changing in the future. We go back in July, to get 4 sealants put on, since some of her adult molars are erupting. Sabotage. Such a serious word, but that is exactly what I am doing to myself and I can’t even figure out a good reason why. Am I thrilled to be smaller than I was even when I got married, yes. Am I truly hungry, no. Do I know I am making horrible choices, yes. Sigh and I was doing so well. Does the head hunger and mindless eating ever stop? And, because there are always so many questions about what exactly I have in my body and how exactly it works, here are a few pics. 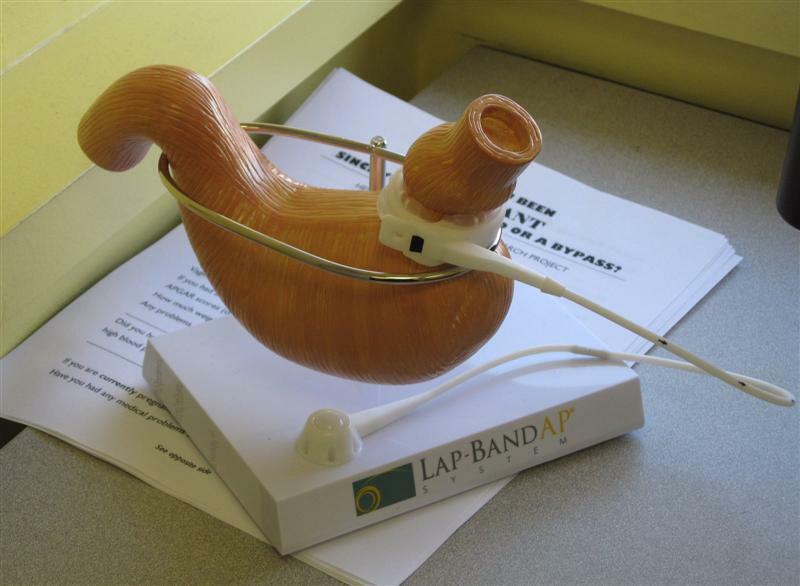 I have the Lap-Band AP, but I am also including a picture of the Realize band, because at the base of the model there are examples of how your stomach tightens as you get fills and restriction. The band is placed around your upper stomach and my port is stitched to the muscle wall about 2-3 inches below my ribcage, slightly to the right of center. Different docs put them in different places though. Pretty neat huh?! Bryan calls me his bionic woman :). Braces are in our future too, probably for all 4 kids. Our plan is to start a dental savings fund, and each year when we get our tax refund put a big chunk in. Sigh. 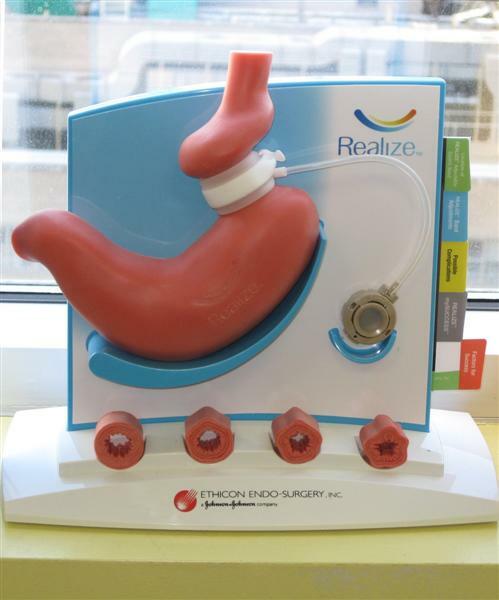 I have the realize band, and my port is on the left…it is weird how every surgeon does it different. How do you do with breads? At my support group last week they talked about how Realize bandsters don’t have the problems with breads like other bandsters. I was just wondering if that was true. I know for certain that my band DOES NOT like bagels, that I learned the hard way after attempting to eat 1/4 of a cinnamon raisin bagel. Braces, eh? Well tell her that this too shall pass. I never had to wear them, but Phillip did. We are hoping that Meghan is like me in that area. I take anything that needs to be ironed to the cleaners as well. That is why I LOVE the new uniforms! The only time I enjoy ironing is when I am quilting…go figure! Good luck on your gate to gate! It is my hope that by fall I can do a 5K. Phillip has done a couple half marys and swears he won’t do them again…..we shall see. Right now I am reading a book by a lady who lost over 100 pounds by running and while telling her story she is weaving in details of running the Marathon here in Salt Lake. Not sure I would ever be able to run a half mary or a marathon…but have tons of respect for those who do and can.